Radon is the product of the decay of other unstable, radioactive elements such as radium, thorium and actinium. The colourless, odourless, tasteless gas can be isolated from these sources but soon decays as it has no stable isotopes. The early pioneers in the study of radioactivity, the Curies, had noted that radium appeared to make the surrounding air radioactive. 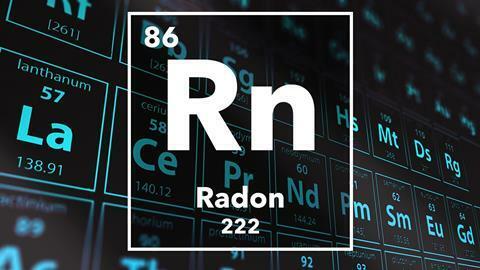 The discovery of radon is credited to a German physicist Friedrich Ernst Dorn, who traced this observed radioactivity to a gas which was given off by radium – a gas which he called 'radium emanation'. Similar 'emanations' were isolated from other elements – for example thorium, and eventually the gas was identified as the heaviest of the noble gases, named radon, and given its rightful place in the periodic table. Radon has a fairly short half-life of only a few days so rapidly decays. Why then should we worry about radon levels in our homes? The problem is, when breathed in, it can decay to form other, longer-lasting, solid radioactive species, which can coat the lungs, leading to continual exposure. These so-called 'radon daughters' include polonium-214, polonium-218 and lead-214 – not family members you'd wish to spend a lot of time with. Prolonged radon exposure is believed to be the second most frequent cause of lung cancer after smoking. 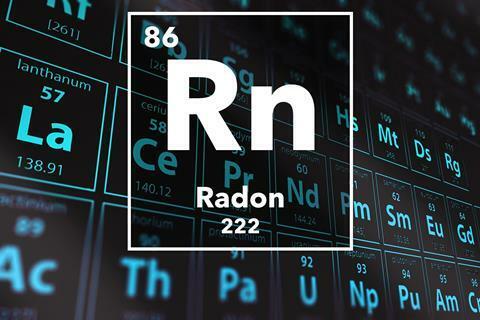 The unfortunate gentleman with the basement full of radon had a risk of consequentially developing lung cancer equivalent to smoking 135 packs of cigarettes every day! So now that I'm comfortable in my freshly decorated new home, all that remains for me to do is to check that my surroundings are as safe as they look. Fortunately that's easily done these days with radon test kits which you can order online. You place them in the corner of a room for three months and forget about them and then send them away to be analysed. OK, so it costs £30 or so – but that's a small price to pay for peace of mind.